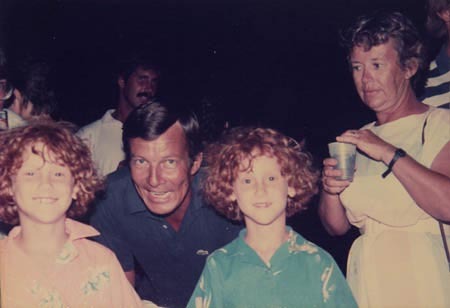 Here's a shot from a party during the filming of Mosquito Coast (released 1986). The twins with Barry Bowen. This article was done for the December 1986 issue of American Film for the release of "The Mosquito Coast" and was written by Digby Diehl. Gracey Rock, Belize, 12:30 A.M. Gracey Rock was nothing more than a wide spot on the Sibun River - unfarmed raw jungle - until it was transformed into the community of Jeronimo for the filming of Paul Theroux's 1982 novel, The Mosquito Coast. The set looks like an army encampment dumped in the Central American jungle, and in this hotbed of political unrest, the resemblance is unnerving. In the middle of the jungle, looking like a foreboding Mayan monolith, sits a juggernaut named "Fat Boy". Built by a latter-day Swiss Family Robinson, this huge ice house symbolizes the technological hubris and American ingenuity they brought to the experiment of starting life over, freed from the decadence and disappointments of modern civilization. Fat Boy is eerily illuminated by large searchlights beaming down from the palm trees, but beyond the lighted perimeter of the set, the jungle is black and intense. The sounds of wild monkeys and tropical birds fill the hot, humid air. The crew moves around under the lights, making sure all is ready for a climactic scene. Paul Theroux's novel chronicles the saga of freethinker and all-purpose handyman Allie Fox (played by Harrison Ford in the film), whose frustration and disgust with life in America leads him to pack up his family and create a garden of Eden in the jungle. Producer Jerry Hellman acquired the rights to the book when it was first published at least in part because he identified with Fox's independence, his anger at modern life. "I understood what he was all about," Hellman says. "His reaction - to get the hell out of here - is a legitimate reaction to modern life, not the only one, but an appropriate one." When I first read the book, I loved the bizarre aspects of it," says director Peter Weir, his ever-present tape deck spewing forth Beethoven's Fifth into the tropical Belize air. Weir is dressed for the jungle in safari jacket and T-shirt and takes an obvious delight in his romantic surroundings. Sweating profusely, he never appears uncomfortable, but basks in both the literal and creative heat. As we drive over the main highway from Belize City to Guatemala en route to the set, Hellman waxes enthusiastic about the project. The two of us bounce along in the back seat with a tape recorder. "A director like Peter never has a 'finished' script," says Hellman. "Most executives in the business think in terms of script. they want to sit and fiddle with 'the script' until they get it right, and they believe they will know what 'right' is. It's foolhardy to think that there is a finished script and then you go out and shoot it precisely as it's written. That's just not the reality. The reality is an ongoing process." Weir divides the writing of a film into three parts: the conception (the screenplay), the realization (the shooting), and the shaping (the cutting). "There's a lot of overemphasis on the original screenplay," he says. "What you really want is the conception, the clarity and beauty of the initial idea. Then the middle period, the actual shooting, is the struggle to realize the idea, given the enormous problem of logistics. The third period, the cutting, is the last chance to write the movie into decent shape. Few outside the cutting room understand that film editing is part of the writing process. It's always assumed to be a mechanical function, but it is, in fact, writing using pieces of celluloid." "Eisenstein said that over and over. And I've found that people who best understand that editing is writing are those who edit film and videotape for news programs," he continues. "I've watched television-news editors fictionalize hard news - I learned more about cutting from them then from anybody. You can take footage of an interview with a Druse militiaman in Beirut and make him anything you want to. You can make him an idiot. You can make him a proud hero. You can make him cruel. This forever destroyed the concept of 'documentary' for me. It's the greatest fiction of all." Directors vary widely in their approach to the filmmaking process; Weir has a reputation as one of the most "open" directors in the business. His method of working would appear to be seat-of-the-pants, if not downright haphazard. Weir's inspiration for his interpretation of Mosquito Coast comes, he says, from the classics, especially Shakespeare and from the opera. "It's taken me a long time to understand where the power was coming from in this story," he explains. In the background, Wagner's Die Walkure is the selection on his tape deck. "There's a tremendous amount of emotion in the story. Unless it is harnessed into some sort of framework by me, I'll be stirring the audience up and they'll wander out feeling uncomfortable because they were moved, but without understanding what to do with their emotion. I think I've got the framework in this operatic feeling. In opera, many times you start with everything wonderful, the songs bright and positive, and then the complexities arise and you end with tragedy." In the living room of the house Weir occupies in Belize (right next door to the production office), he has ample evidence of his thematic motifs spread out across every available surface. On a large bulletin board he keeps postcards, pages from magazines, and other items that embody the look or the visual impression he wants to give various portions of the film. "A letter sent to me, a snapshot of a child in a village, a pressed flower, a match box, colors... they all have a meaning. It's a question of texture, a kind of mosaic of inspirations. If you look carefully, you'll see that almost every key scene is represented by something or other. That's how I've always done my films. I like to have these things around me and let them have their influence as they might." Weir realizes that his approach is not without danger. "I like to open the door to chance. That implies enormous risks. You presume on the muse visiting you, but at the same time you don't count on it. Driving to work you see street scenes - a face, a hat, a detail - that you often end up putting into the film that very day. I saw a man with a plastic bag on his head with just the face part cut out and a straw hat on top of that and said, 'Let's do that.' But it won't help the drama itself. You've got to have good acting and good thinking." From Harrison Ford , Weir says he gets both. During the filming of Witness, the actor and director established an extraordinary partnership, Ford, the logical man and self-described "technical" actor, is the perfect complement to Weir, the improvisational visionary. "I supply him with something, he supplies me with something," Ford says. "We both benefit from the exchange. Peter has a vision and it's not always articulatable, if that's a word. I'm a person who calls for logic and even a plodding kind of determination to have all the cards on the table. I'm the assistant storyteller." Ford found the eccentric character of Allie Fox a welcome change from heroic roles. One night, while waiting for the gigantic generators from Miami to be repaired so that shooting could resume, we sit in his air-conditioned motor home/dressing room talking late. He is exhausted, at the end of a long, hard location shoot, and he is beginning to take on the character of Allie Fox in earnest. "I had none of the difficulties that other people had expressed with the character being too irascible, too unconventional," he says. "I found him more often right than wrong in what he was saying. There is also the complexity of the family story, the relationship between a father and son and between a husband and wife. There is humor and pathos, a real range from antic comedy to gut-wrenching stuff. The simple exercise of emotion is something that people don't get very much. At the moment, most films depend more on kinetics for their effect than on having any emotional resonance." Ford also welcomed the opportunity to work again with Weir, who is gradually gathering his own "reportory company" of crew and actors. And small wonder - Weir is known for running a happy ship. The crew in Belize is a pastiche of Aussies, Brits, and Yanks that number about 150. And key personnel such as director of photography John Seale and film editor Thom Noble, are veterans of other Weir films. "This crew is a combination of people from Witness who I found exceptional, mixed with the old crew that go back to my early films in Australia.," says Weir. "Here on location, we have that kind of intimacy that only comes on a set. It doesn't exist in peacetime, you might say. On location in the jungle you don't have the nine-to-five mentality that you have in city shooting. I like the concentration that results from everybody being at hand and from the ideas that abound in the surroundings. The atmosphere of the film is within the setting all around you. You disappear into the film." He gestures toward the crowded bar of the Villa Hotel, where the Mosquito Coast company is drinking, dancing, and laughing with the locals. Weir frequently holds court there, staying late into the night after a day's shooting. In the background, the music of the Turtle Shell Band, an Afro-Caribbean group from the Belizean coast, issues forth from Weir's tape deck. "Belize is the Mosquito Coast," Hellman says. Although Theroux was unaware of it at the time he was writing the story, the fictional Allie Fox turns out to have a number of factual counterparts. "Central America is full of Allie Foxes," says Weir. "I've heard of four of them since I've been here in Belize. Many of them came down here in the late sixties. Belize is one of the last places in the world where you'll find the drifters, the travelers. No one is down here just on a holiday. If someone says they're here on vacation, you know they're CIA or they're drugs." For the people who live in Belize, however, the filming of The Mosquito Coast is the biggest story that's come their way in a long while. The making of this movie was practically all I heard anyone talking about from the moment I arrived at the rustic, dilapidated airport. Whether I was in a fishing boat or a taxicab, the natives quizzed me about the moviemaking. No wonder they were fascinated: In a tiny (population 148,000) agricultural country, the filming employed about three hundred local residents, spent seven or eight million dollars in foreign exchange, and made executive producer Saul Zaentz, for a time, the third largest industry in Belize. Despite Belizean government cooperation, the logistics of the production have been awesome. The company had to build roads into the jungle, support an entire small hospital for emergency help, coordinate with fifty local contractors who were accustomed to a leisurely Caribbean pace of life, and stay out of the myriad political skirmishes among the Belizeans, Guatemalans, Salvadoran refugees, and native Indians. In Mexico City, a convoy of catering trucks met up with the motor homes (to be used as dressing rooms) and portable honey wagons, and meandered down the so-called highways of Mexico and Central America to Belize. Shiploads of other trucks and equipment, including three huge electrical generators for night shooting, arrived from Miami. And an exhausted team of couriers shuttled film back and forth from a Miami lab for dailies. (The local airline, TACA, was quickly dubbed "Take A Chance Airline.") "The Miami connection has been a godsend," says production coordinator Judi Bunn. "You have no idea how crazy people get when they can't buy the right American shampoo or deodorant. It's wonderful to have the New York Times brought in on Sunday. Of course," she adds with an emphatic British accent, "I had to wait until Tuesday for the London Times." At the main jungle location in Gracey Rock, a bulldozer begins clearing an area where the main house for Allie Fox and his family will be built. Ninety feet into an anticipated one-hundred-foot space, the bulldozer hits a twenty-foot-high mound of rock. The Mosquito Coast has made an archaeological discovery: an unrecorded Mayan site, probably a minor temple or residential building. Weir modifies their set location plans, but is using the Mayan temple mound as a camera platform for the final Fat Boy sequence. At 1:45 A.M., first assistant director Mark Egerton signals that all is finally ready for that scene to begin. Harrison Ford, looking quite deranged in wire-rim glasses and slicked-down hair, is sprayed with "sweat". Jerry Hellman swats a mosquito and sprays himself with Deep Woods Off. Peter Weir, grinning puckishly, gets a laugh from the assembled cast and crew as his tape deck blares out Gladys Knight's "I Heard It Through the Grapevine." He greets them by saying, "OK, ladies and gentlemen. Welcome to the late night show. Now, let's do it!" Shortly thereafter, red horns of fire sprout from Fat Boy's head and flames belch forth from its eyes and nose. Civilization has its revenge on Fox and his family as the technological monster rocks the jungle in a series of violent explosions and destroys their dream of Eden. "The Mosquito Coast" is a film I think very highly of even though it is not (in my opinion) your typical Hollywood fare. In fact, I think it is a ways off the beaten track, so for filmgoers who like something more out-of-the-way, this is a pretty good film to partake of. It is, I think, a film with a "message" in it, and while this is certainly nothing new in movies, I think part of the charm of the picture is that the message is very succintly understated (you do have to think about it). It is certainly well-acted by all the performers in it-- Harrison Ford, Helen Mirren, and River Phoenix deserve special praise for giving very fine and probing performances to their characers (all three are very good in virtually anything they appear in--yes, I know that River Phoenix is deceased and that is too bad because he might have gone on to become a truly great star and actor, had he lived), and Peter Weir's direction ("The Year of Living Dangerously", "Dead Poet's Society") is masterful--especially because I believe that the subject matter of the story was not easy to convey. It is also beautifully photographed-- especially the sequences out in Mosquitia, which is along the Carribbean coast in Central America. But let the viewer be warned: This story is a tragedy, and the end of it does have a certain pathos to it. Essentially, it is a uniquely American story, even though it happens largely outside the U.S. It surrounds the Harrison Ford character, and is essentially a character-study of this strange and unique man and his angry dilemma, and his subsequent "fall from grace". I believe the "study" of the Ford character in this film is comparable to the roll that Humphrey Bogart had in "Treasure of the Sierra Madre" in that it is also a look at a person who is driven to great desperation not only by his own desires and weaknesses, but also by his own vanity. A must see!